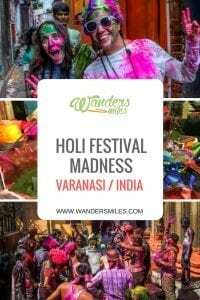 Varanasi for Holi Festival is not for the faint-hearted but it is an experience I will remember for years to come. We saw it from the back streets, the boat, neighbouring village and the Aghori Monk perspective; it was absolutely bonkers! Holi (pronunciation: /ˈhoʊliː/; Sanskrit: होली Holī) is a Hindu spring festival celebrated in India and Nepal, also known as the “festival of colours” or the “festival of love”. It takes place over two days, and is a celebration of fertility, colour, and love, as well as the triumph of good versus evil. The four main powder colours are used to represent different things. Red reflects love and fertility, blue is the colour of Krishna, yellow is the colour of turmeric representing inner purity and pride and green symbolises spring and new beginnings. If you’ve not experienced Holi of Indian soil, it’s hard to know what to expect so here’s a few handy hints to get ready for the madness. Get colour supplies in the night before: There are stalls on the streets and I can understand why they don’t sell on the day as there is water being thrown around everywhere. Stock up on food: Literally everyone gets involved so the shops and restaurants will be shut until round 5pm. Protect against discolouration: It’s hard to avoid but we covered ourselves in baby oil (don’t forget behind the ears and up the nose, leave no stone unturned) and had an outfit that we could put straight in the bin afterwards. I bought a wig to cover my hair but this got commandeered by a local, I had to resort to a scarf which only covered the top of my head. I came home with blue hair at the bottom, I was told it was cool but the hairdresser had to bleach it out. Cover your cameras: You don’t want to miss out on some once-in-a-lifetime shots so make sure you take the extra steps to protect your camera or your smartphone. Prepare for lots of touching: Once in the crowd, things can get a little crazy but we were fortunate enough to have a local guide, Streetwise Varanisi Tours, who employed more manpower to help us through the day as the group had a lot of women… and the guys do like to hug you! So we were ready and armed with wigs and powder to throw. Our guides arrived with silver faces looking slightly robotic and scary but we were safe with these guys! We were ambushed from the rooftops, from down the side streets and within our own group… so much fun! We found a party by a temple which was totally mental (that’s where my wig went awol), we danced around with the locals till it got a little crazy then made our way to the ghats where our boat was waiting. The boat took us over to what we thought was the quiet side of the Ganga, how wrong could we be? The villagers were just as crazy for celebrating Holi! We were invited to party in the garden of a local house and got covered again in more colour by the revellers, we left there and dived into another garden party, ladies only this time, everyone was in such high spirits, I can’t even explain how amazing this was! The final chapter of our day got slightly surreal, we had the chance to meet an Aghori Monk, normally reclusives so very hard to make a meeting with and some say to stay away altogether. Aghori derives from the Sanskrit word “Aghor” which means absence of darkness and implies natural state of consciousness where the mind is free of fear and repulsion. They are devoted to Shiva manifested as Bhairava, a powerful Hindu god of death and destruction often ominously referred to as “The Destroyer”. Aghoris are feared across India but the most respected clan of the Sadhus, the exiled Aghori monks of Varanasi feast on human flesh and reside near cremation sites in search of spiritual enlightenment. So you can understand when we walked into the tent on a remote side of the Ganga where we found human skulls, we felt a little like sh*t just got real! The Aghori Baba (guru) that came over to see us by boat had a student with him that spoke English so he talked us through his thoughts and beliefs. The Aghoris can recognise negative energy in your faces and protect you from evil by chanting mantra. The Baba found it hard to recognise any pain in our faces due to the colour from Holi Festival but some of our group came forward to take part in the ritual of removing evil spirits… like I say, pretty freakish stuff! India is the land of so many festivals where people happily celebrate all the festivals. Wow I can’t believe you experience Holi in person! I bet it was absolutely incredible! Absolutely mental… I was supposed to go to Pushkar for Holi this year, so sad I missed it… definitely next year!